Reading is a gift and literacy is a basic need as well as a right for every individual. As parents, one of the most precious gifts that we can give to our children is the ability to read. It is our greatest desire that at an early stage of their life they can be able to grasp things so quickly. But how? With the presence of television shows and characters which they idolized. It becomes a big struggle to divert their concentration. That is why as parent, it is our responsibility to properly guide them and help them understand the value of reading. With the right reading skill, your child will find studying much easier. Below are some of the tips that we can apply to our child. 1. Limit your child’s time spent in watching television. 2. 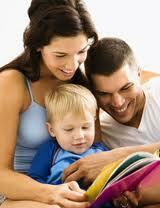 Make reading time a bonding time especially with small children. 3. Let the small children get involved in the story. Allow them to turn the pages of the book and let them enjoy observing the various pictures and figures inside. 4. Ask your child some questions after a reading session. Always remember that reading is also a skill which will be a good value when she goes to school. Studies have shown that humorous stories will keep children’s attention longer than other stories. Try to be appropriate in choosing books for your child.